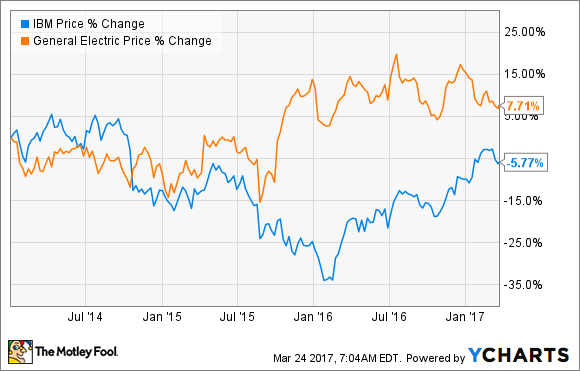 Will General Electric Company Have to Abandon This Key Target? The industrial giant's progress toward $2 in operating EPS by 2018 brings up memories of IBM's failed attempt to hit $20 in EPS by 2015 -- but is the comparison a good one? Is General Electric Company (NYSE:GE) set to abandon its target of $2 in operating EPS (earnings per share) by 2018? It surely wouldn't be a welcome event: Just ask investors in International Business Machines Corp. (NYSE:IBM) after the IT giant abandoned, in late 2014, its target of EPS of $20 by 2015. IBM's decision followed its coming to terms with fundamental declines in its legacy businesses; the stock is still below the level it traded at before the announcement was made. Is GE experiencing the same problems? As you can see in the chart above, the market appeared to have serious doubts that IBM would hit its target in 2015. In fact, before abandoning that target in October 2014, IBM was trading around $180; in other words, if it had hit its $20 target, it would have had a forward price-to-earnings ratio of just 9 times earnings. Simply put, the market didn't believe in the target, as IBM's revenue growth from services and systems had been challenged in the preceding years. It's taken time for IBM to recover, and the stock is now arguably cheap. As you can see below, it remains a prodigious generator of free cash flow (FCF) -- a ratio of enterprise value (market cap plus net debt) to FCF of just 15.5 looks like a good value -- and it's attracted the attention of billionaire investors. The hope is that growth in its strategic initiatives (big data, analytics, cloud services, mobile, and IT security) will help offset declines elsewhere. Indeed, analysts expect IBM's revenue to be roughly flat in 2017. 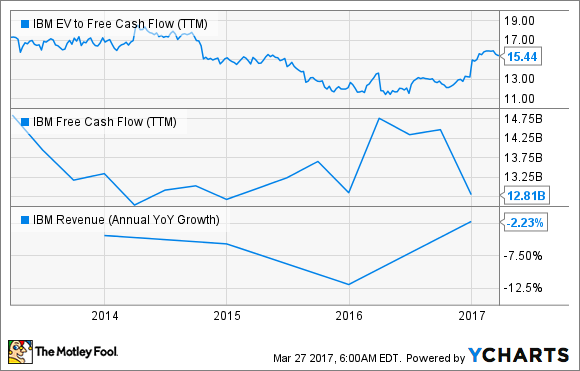 IBM EV to Free Cash Flow (TTM) data by YCharts. What's going on at GE? Based on GE's target of $2 in operating EPS by 2015, the stock currently trades at 14.8 times earnings. It's not quite as cheap as IBM was -- indicating that the market has more faith in GE -- but the stock is in negative territory on a one-year basis, while the S&P 500 is up 15%. Moreover, GE CEO Jeff Immelt started out 2016 expecting organic revenue growth of 2% to 4%, but the company only hit 1% (including the Alstom acquisition). To be fair, EPS of $1.49 in 2016 was within the target range of $1.45 to $1.55 the company gave at the beginning of the year, but it was only so because of better-than-expected dividends from GE Capital (partly used to boost buybacks, and ultimately EPS) and asset sales. GE's core power segment missed management's expectations in the fourth quarter, and growth with its new large H-class turbines might not offset any weakness in its smaller-class turbines in future. Overreliance on contributions from the Alstom acquisition -- GE may be encouraging order growth by sacrificing margin. The merger with Baker Hughes Incorporated is only going to increase exposure to energy prices. Economic weakness in the Middle East could affect power and oil and gas orders for GE -- the region contributed 28% of power-segment revenue in 2015. To put these arguments into context, GE's equipment orders were $55.2 billion in 2016, representing a decline of 2%, but if you exclude Alstom they were down 21% to $43.3 billion. While GE's overall backlog was actually up 2% in 2016 to $321 billion, it was due to a 4.9% increase in services orders, and there is no guarantee these will be as strong in the future. Bears will see future services order growth as contingent on future equipment orders, and given that equipment orders declined in 2016, it could mean services orders will slow in the future. A GE gas-turbine compressor. Image source: Chris New for GE Reports. A more positive outlook sees oil price stabilization as a precursor to growth; in fact, GE's organic oil and gas orders grew 2% in the fourth quarter. Meanwhile, there is no point trying to mentally exclude Alstom earnings from GE's numbers, because Alstom's former energy assets are a part of GE and of what you are holding when you own the stock. Moreover, GE has an opportunity to generate earnings growth due to its own initiatives with Alstom and the Baker Hughes merger. As for equipment orders, the truth is that services backlog makes up $237 billion of the $321 billion backlog in the fourth quarter, and GE's investments in the industrial internet are largely driven to increase its revenue from services in the future. GE is a lot more than just equipment sales. Time to be bearish on GE? Image source: Getty Images. Is GE the new IBM? In terms of structural decline in its core businesses, the answer is no: It's not another IBM. The reality is that GE has faced cyclical weakness in oil and gas, and to a certain extent in power -- in fact, its H-turbine has helped counter market weakness -- and in the Middle East region. However, any weakness in oil and gas could create significant challenges for GE in hitting its target, and that's not something investors would welcome at all. Cautious investors may want to see a couple of quarters of hitting revenue expectations, and some solid equipment orders growth, before making their minds up on GE's prospects of hitting its $2 target.